You may be out of your time zone but not your comfort zone. SDR Mactan Serviced Apartments in Cebu provides you your own slice of paradise from PHP 1,400 per night (GST inclusive) based on monthly stay or PHP1,999 per night. Private balcony and stylish contemporary furnishings. Our apartments are designed to give you room to work and live in comfort. To view our rooms, check out our Videos and Photos. We have a convenient business center for those without their laptops. We can arrange an airport pick-up with minimal charge P350 for salon car and P550 for mini-van upon guest request. Our philosophy is truly simple – SDR believes in delivering way more for your buck! No sneaky “10% Service Charges” here! All our rates include GST. We promise a home away from home in paradise at an all-inclusive affordable price. 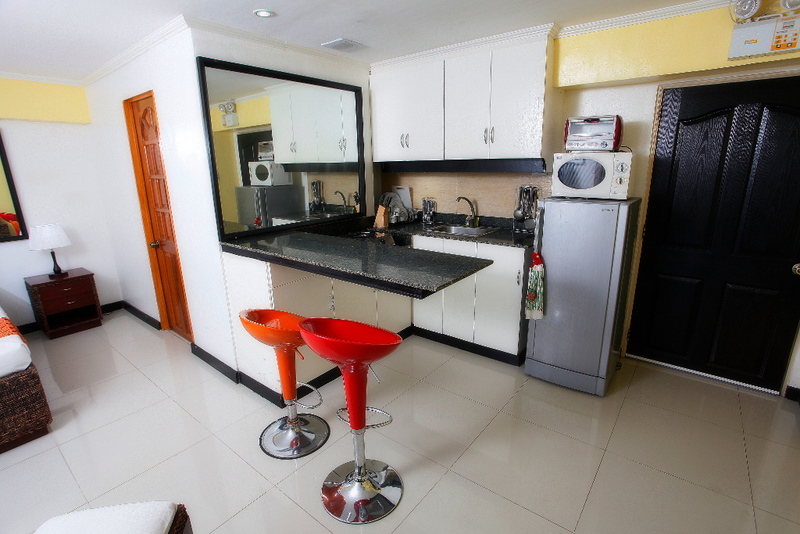 SDR provides a 36.5 sqm Cebu hotel room with a kitchen. We can make your stay in Cebu very memorable through our SDR Cebu Tours. Take advantage of our Online Rates and book now via our 24-hour Online Booking Chat! or fill in our reservation request. You may contact our (24-hour) SDR Reception at +63-32-2383929 or e-mail us: bookings@sdrapartments.com or chat with us now (below left hand bottom of this website) online 24/7. SDR is your #1 accommodation of choice in Cebu. Budget living for less. SDR Mactan Island Serviced Apartments: Paradise For Less. Cebu budget Hotel deals. Voted #1 specialty accommodation in Lapu Lapu City, Cebu on tripadvisor.com Lapu Lapu City is the historic heart of Cebu. Surrounded by resorts, beaches and history.